Energy Projects Plus is delighted to have been recognised at the recent National Green Deal and ECO Awards 2014. We were awarded second place in the ‘Fuel Poverty Campaigner of the Year’ category, which recognises individuals who have made an outstanding contribution to raising awareness of fuel poverty and leading the fight against it. Energy Projects Plus has worked to alleviate fuel poverty across Merseyside and Cheshire for nearly 20 years. During this time we have helped over one hundred thousand people reduce their energy bills and maximise their income through the provision of free and impartial advice, providing support with the installation of energy efficiency measures, switching to cheaper energy tariffs and addressing fuel debt. We continue to work with local authorities, housing providers, community groups and other charitable organisations to deliver a collaborative approach in the heart of the community. Community groups and local organisations are welcome to come along to the launch of the new Wirral Fuel Debt Advice Service at Wallasey Town Hall at 9.30am on Thursday 17th April. Energy Projects Plus has received funding from the British Gas Energy Trust to deliver the Wirral Fuel Debt Advice Service, which is delivered in partnership with Wirral Citizens Advice Bureau to help those in financial hardship. Wirral residents can apply to the service if they are in arrears to their gas or electricity supplier and are unable to pay off the debt. Come along to the launch event to find out more. Schools across Merseyside and Halton will able to benefit from a whole host of support activities to reduce their waste and become more resource efficient, thanks to a project being funded through the Merseyside Recycling and Waste Authority (MRWA) and Veolia Environmental Services Community Fund. The School Waste Action Programme (SWAP) project is managed by the Eco Resource Network, who are a group of Merseyside based charities: Energy Projects Plus, Faiths4Change, Liverpool World Centre and Rotters Community Composting and will offer schools hands on support to reduce their impact on the environment and to engage with and trial different ways to reduce their waste from purchasing to recycling. More than 50 schools across Merseyside and Halton have applied to join the School Waste Action Programme, and eight have been selected for one to one support .The SWAP project will provide a dedicated Officer to enable the whole school community to engage with and trial different ways to reduce their waste from purchasing to recycling. The aim is to enable the eight SWAP schools to reduce their waste by up to 25% by May 2014. The remaining forty plus schools won’t miss out though as they will be able to access other support to reduce waste including a workshop ‘Sustainable Schools: Where teaching meets school business management’ in January 2014 which will provide learning and networking experience to help schools create and embed a sustainable procurement plan. Included in the support for all the schools will be the Textile Challenge which enables the whole school community to get involved. A school assembly will launch a textile collection in each participating school and all kinds of textiles – from curtains to cardigans – can then be brought in for recycling with every item contributing towards a recycling payment to each school too. 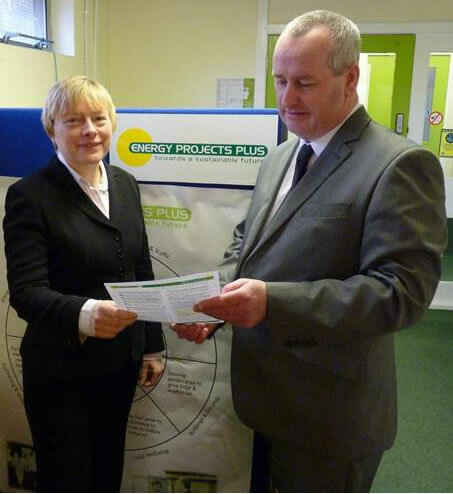 Energy Projects Plus was pleased to receive a visit from Angela Eagle MP at our Wallasey office on Friday. Angela spoke with members of the team and was particularly interested in the work we are doing with Wirral Children’s Centres through the Warm & Well project. Warm & Well has seen around 900 Wirral families with pre-school children benefit from practical advice on growing their own food, healthy eating and reducing their energy bills. A calendar was produced with pictures of the families who took part in the workshops and Angela was presented with a copy to take home. Warmth4All has been awarded funding to continue for a second year, after establishing an innovative partnership with Widnes Foodbank and helping 1,300 local residents tackle fuel poverty. We are now inviting community organisations, who may be interested in getting involved to contact us. More than 1 in 5 people across the City Region are currently living in fuel poverty and with the recent announcement of significant fuel price rises; this number is expected to increase. Warmth4All, managed by local environmental charity Energy Projects Plus, helps vulnerable households within Halton, Knowsley and Liverpool out of fuel poverty by working with community organisations such as Widnes Foodbank. Funded by the Scottish Power Energy People Trust, the project has a face to face approach which is achieved by harnessing the support of faith communities via project partners Faiths4Change and Parish Power to take reducing fuel poverty to the heart of disadvantaged communities. A major focus of activity for Warmth4All has involved the attendance of expert advisors from Energy Projects Plus across the network of six Widnes Foodbank centres, to give residents practical support to help them keep their homes warm at an affordable price. Clients are offered a wide range of support which includes energy saving advice, support to switch to a cheaper tariff, grants to clear fuel debt arrears and referrals for benefit maximisation and energy efficiency grants. By working in partnership with Widnes Foodbank, the Warmth4All team can engage directly with the most vulnerable in an environment where clients feel supported. The two services complement each other; emergency issues are dealt with through the receipt of a food parcel and advice on financial support and fuel bills is provided to offer a longer term solution to fuel poverty. Warmth4All also offers an accredited training programme to establish a network of Community Volunteer Energy Champions, enabling them to share advice and information across the community groups that they are part of. There are now 52 Warmth4All Energy Champions across the City Region, creating a legacy beyond the life of the project. Those interested in finding out more can contact Emma Ashcroft on Emma.Ashcroft@epplus.org.uk. Don’t miss the Retrofit Roadshow taking place at the ACC Liverpool on 3 September as all the key players from the region will be there. The Roadshow is a must for organisations looking to develop retrofit strategies; access the key players; capitalise on local retrofit opportunities; learn from best practice and see the latest innovations. The government has pledged to cut greenhouse gas emissions by 80% by 2050 and to achieve this ambitious target we need to retrofit 700,000 properties a year – that’s 13,000 per week! Retrofitting is upgrading existing buildings with energy efficiency or renewable measures in order to reduce the amount of carbon emitted. The Liverpool city region retro-fit market alone is estimated to be in the region of £50bn and five months after the launch of the Green Deal the North West is leading the way as the region with the most Green Deal assessments. This is probably due to our many pioneering initiatives. Project Viridis is a great example where a consortium of social landlords have signed up to a programme of work which will retrofit 100,000 houses in Liverpool. Alliance is the UK’s largest procurement initiative for social landlords with over 1,170 members. Set up by Fusion21, they have instigated solar, insulation and heating agreements that have delivered extensive home improvements, created jobs and saved ££s off householder bills. Greater Manchester Low Carbon Hub (part of AGMA) is also looking to deliver a range of low carbon projects that will provide several opportunities for low carbon suppliers in the region. Peter Owen, Chief Executive of Energy Projects Plus, will be speaking at Retrofit Roadshow about large scale retrofit projects delivered in Merseyside. This one day event will be packed with presentations, workshops and retrofit clinics with time set aside to network, plus a comprehensive exhibition of retrofit technologies. Delegate prices are only £125 + VAT per person. Discounts apply for multiple delegate bookings and Public Sector delegates. To book your place visit www.retrofit-roadshow.co.uk/book or call 01743 290001. 10% Early Bird discounts apply for delegate bookings before the end of July, use discount code EBDRFR10 – places are limited.